As President Obama's approval numbers begin to climb, there is one glaring failure that has taken a back seat to the Giffords shooting and the symbolic vote to repeal "Obamacare" by the House. This failure is one that I have spoken about in the past, ruffling the feathers of many progressives who seem to choose to point to Obama's successes–a watered-down health care bill, a months-too-long repeal of DADT–rather than point out where he can improve. 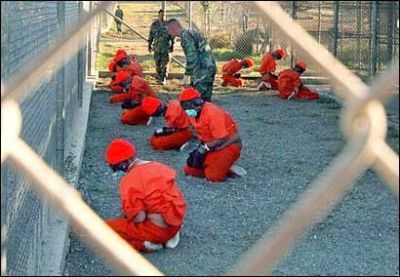 This failure, of course, is Guantanamo Bay, the blemish of which America seems unable (or worse, unwilling) to rid itself. While Obama promised that Gitmo would be closed within a year of taking office, and signed an executive order to that end, it remains open and fully functional. If this is not bad enough, Obama has now fully reversed his decision to close Guantanamo by embracing a Bush-era policy of holding military tribunals on the navy base in Cuba. A policy that Obama heavily criticized while running for office in 2008. Back then, he said, "These trials are too important to be held in a flawed military commission system that has failed to convict anyone of a terrorist act since the 9/11 attacks and that has been embroiled in legal challenges." Now he seems more than willing to participate in a process that, by his own words, is a failure. While Mr. Ghailani faces between 20 years and life in prison, many Republicans have pointed to his acquittal on 284 related charges — and a judge’s decision to exclude an important witness because investigators learned about the man during Mr. Ghailani’s C.I.A. interrogation — to argue that prosecuting terrorism cases in federal court is too risky. So the fact that a judge was following the law and not allowing torture-based evidence (the treatment of one detainee who will face a tribunal was so bad that video of it was destroyed by the CIA) means that trying individuals in federal court is too "risky"? This sets a very, very disturbing precedent and the fact that Obama, a lawyer, is going along with it makes it all the more scarier. And just when you thought it couldn't get worse, it does. On top of all of this, the Obama administration is attempting to rewrite history. The bombing of the USS Cole back in October of 2000 was handled as a peacetime terrorist attack. Because of this, a military tribunal would be an inappropriate venue to charge a suspect because it did not take place during hostilities against al Qaeda, which began after September 11, 2001. What the Obama administration wants to argue is that, according to the New York Times, "a state of armed conflict had legally existed since 1996, when Osama bin Laden declared war against the United States." That would extend the "War on Terrorism" into the first term of Bill Clinton, essentially rewriting history. To sum up what Obama wants to do: work within a system he's already declared a failure, bow to Republicans who feel following Constitutional principles when trying our enemies is "too risky," and rewrite history to justify all of this. For all of the protests and crying out about George W. Bush's extralegal track record, where is the same outrage for Obama's?